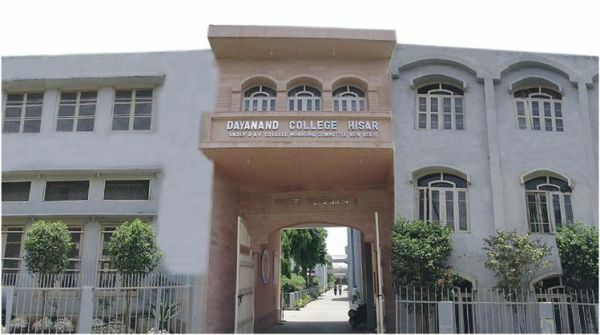 Dayanand College, Hisar is a multi-faculty co-educational government-aided institution affiliated to Kurukshetra University, Kurukshetra and is duly recognized by the UGC for the purpose of all kinds of development grants. The college has been accredited B++ by NAAC, Bangalore. The college is situated on two campuses occupying a total land areas of about 28 acres (4 acres for the college complex and 24 acres for Hostel, staff Quarters and Sports grounds etc.) It imparts instruction in different streams including Arts, Commerce, Science (Medical, Non-Medical, Electronics, Computer Science, Biotechnology, Electronic Equipment Maintenace, Food Science and Quality Control, Diploma in Computer Maintenance and Networking and Instrumentation). It also runs P. G. Course in English.